Addition and subtraction in wild New Zealand robins. • New Zealand robins search longer when finding fewer worms than they watched being hidden. • Robins search longer after finding different types of worms than those seen hidden. • Wild robins spontaneously respond to addition and subtraction of small quantities when expectancy is violated. This experiment aimed to investigate proto-arithmetic ability in a wild population of New Zealand robins. 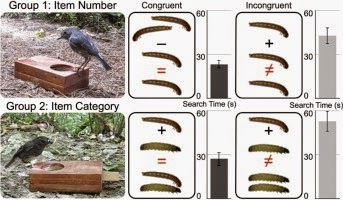 We investigated numerical competence from the context of computation: behavioural responses to arithmetic operations over small numbers of prey objects (mealworms). Robins’ behavioural responses (such as search time) to the simple addition and subtraction problems presented in a Violation of Expectancy (VoE) paradigm were measured. Either a congruent (expected) or incongruent (unexpected) quantity of food items were hidden in a trap door out of view of the subject. Within view of the subject, a quantity of items were added into (and in some cases subtracted from) the apparatus which was either the same as that hidden, or different. Robins were then allowed them to find a quantity that either preserved or violated addition and subtraction outcomes. Robins searched around the apparatus longer when presented with an incongruent scenario violating arithmetic rules, demonstrating potential proto-arithmetic awareness of changes in prey quantity.